This begins what will be a series of posts on the Brooklyn neighborhood of Sunset Park. It’s meant as a companion to a community outreach project to link materials from the Municipal Archives with communities, starting with Sunset Park. The project uses historical records that relate to infrastructure—physical, human, and imagined, according to Pauline Toole, Commissioner, NYC Department of Records and Information Services. Rendering, proposed Sunset Park swimming pool. Signed C.M. Flynn, Del, '34; R.C. Murdock, Landscape designer; M.A. Magoon, Architectural designer. January 5, 1935. NYC Municipal Archives. For any newcomers: Sunset Park really is a park, on a hillside facing the sunset, but it’s also busy avenues, schools and churches and hospitals, thousands of homes, commerce and transportation hubs, down to and including the vast, flat, industrial waterfront of Bush Terminal (later Industry City). The neighborhood adds up to more than the sum of all its many and diverse parts, its past and present and fast-arriving future, because all these parts interact. Everything is subject to change, and open to debate. Boundaries are moot, new names always lurking. The name came with the park in the 1890s, but wasn’t attached to the whole neighborhood until the 1960s, when real estate needed help. Still, let’s start at the top, infrastructure at its most infra: not a hill so much as a ragged line of hills, the remains of a ridge, lying northeast to southwest, marking the southernmost advance of the last glaciers to cover Long Island. The glaciers may have stood a thousand feet high. As they began to melt, and recede northward, they dumped boulders, gravel, and dirt. (People moving out always leave things they don’t want.) Down-running streams carried the smaller bits to enrich the flat, once-fertile fields of Dutch Gowanus, the southernmost reach of the old town of Brooklyn. Top: Under construction, 1935. 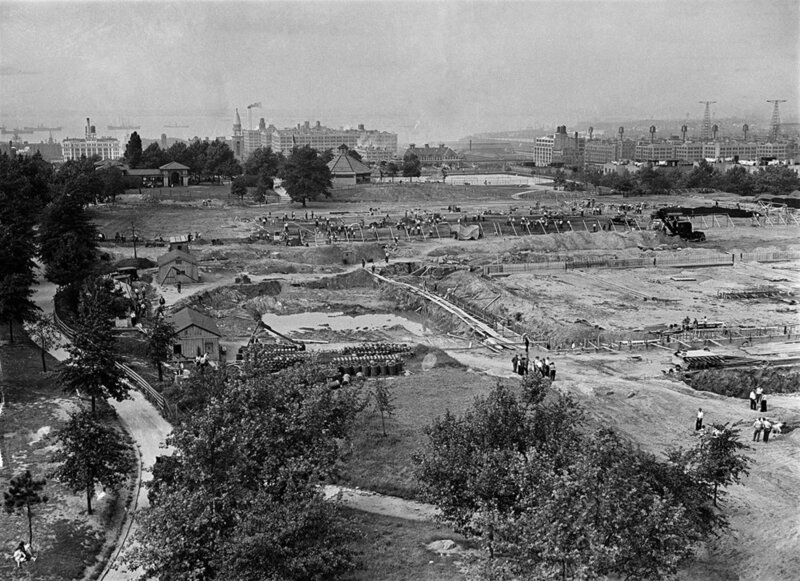 Bottom: Under construction, 1936. NYC Municipal Archives. Undated photo of Sunset Park showing the main swimming pool and one of the smaller semi-circular pools. When the pool opened, it had a separate diving pool on one end and a wading pool on the other. NYC Municipal Archives. These are the Brooklyn Alps: Mount Prospect, 200 ft., on Eastern Parkway, next to the Brooklyn Public Library; Lookout Hill, 177 ft., at the south end of Prospect Park; Battle Hill, in Green-Wood Cemetery, 220 ft. and the highest point in Brooklyn; Sunset Park, 164 ft., the “peak” just west of 7th Avenue at 43rd St.; then slowly dwindling to Owl’s Head Park, 69 ft., in Bay Ridge, before bolting up across the Verrazano Narrows as Todt Hill, 401 ft., on Staten Island, the highest point in the five boroughs of New York City. Not the Swiss Alps, to be sure, but in Brooklyn, we are proud. Some of us even climb them all. 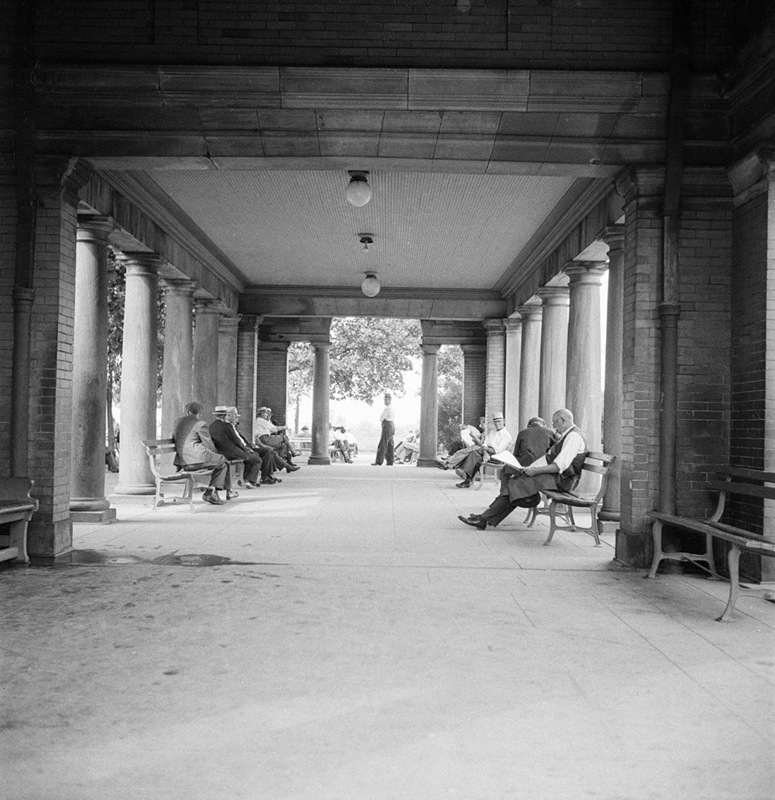 Interior of old Sunset Park pavilion. July 25, 1934. NYC Municipal Archives. At least one internet travel site is convinced that Sunset Park is the high point of Brooklyn, but no one can dispute that the views compete with any other B-Alp. Just to the north, the cemetery rises as a tree-covered hill and forms one natural boundary of the neighborhood. A second, plainly, is the harbor to the west, on gorgeous view. Buildings block the eastward prospect, and whether in that direction Sunset Park ends at 7th Avenue, or down the hill at 8th or 9th, before becoming Borough Park, depends on whom you ask. The southern view along the ridge line, also limited, does not extend to the expressway cut below 64th St., the practical border of Bay Ridge, née New Utrecht. Sunset Play Center entrance, November 2016. Photo: Marc Kirkeby. Like almost every other hill in Brooklyn, the ridge was chopped and graded and gridded, starting in the 1830s, as streets of houses replaced farms. The top of the hill became—and surely will remain—residential. In 1891, seven years before the merger with New York City, the City of Brooklyn bought some land around the greatest elevation, and from there the park slowly grew and developed, over two decades, to its present dimensions, bounded by 5th and 7th Avenues, 41st and 44th Sts. Once there was a carousel, and six holes of golf. On a hillside. Sunset Play Center, November 2016. Photo: Marc Kirkeby. The modern age of Sunset Park began 80 years ago, thanks to the Works Progress Administration, with a redesign, new park buildings, and a large public pool that opened in 1936—one of an astounding 11 public pools to open in New York City that summer. The local economy endured some alpine drops in the decades that followed, but the place and park endured, and people climbed back up. The City rebuilt the pool, plumbing, and playgrounds again in the 1980s, and the Sunset Play Center, as it’s called now, goes on. You should see for yourself. From any direction, you’re looking up at it, and that’s appropriate. The faces have changed with time, but Chinese families and Latino families and Jewish families and hipster families and whoever else passes through Sunset Park, continue to enjoy and benefit from what’s here and largely unchanged. A nice place to gather. Swimming lessons and tai chi. Through an era of urban “renewal” that often failed to renew, the Sunset Play Center has done what it was meant to do, it helps hold the place together. It belongs at the top of the hill. It is aspirational. Maybe it is the high point of Brooklyn.